Mumbai, 30th January 2019: From haute couture, which has been Varun Bahl’s signature fashion statement, the designer launched Varun Bahl Prét at Lakmé Fashion Week Summer/Resort 2019. “The Five Petal Story”, was a collection of ready-to-wear separates and coordinates that will thrill Varun’s loyal followers. The bouquet of unique prints with creative touches of hand embroidery were beautifully splashed on the ensembles and will surely be part of favourites in the lady’s wardrobe. Celebrating his love for flowers, Varun visualised a delicate 5-petal blossom that was so versatile that it appeared in multiple prints and as embroidery. It was seen tantalisingly on micro-floral gingham checks as well as on damask and mosaic prints, while the five-petal motif was achieved through tessellation. The 3D laser cut flowers were also added to create more drama on the creations. Known for his amazing appliqués, Varun also amalgamated some wave like seams with the hems on the outfits. 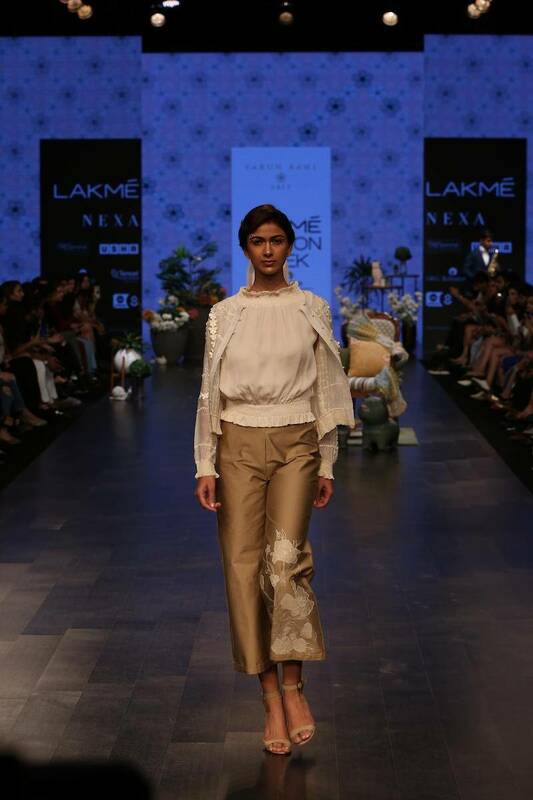 Relating “The Five Petal Story” on the catwalk in pastels, Varun was partial to ivory but added his favourites like old rose, pistachio, duck egg blue, ochré, olive, faded mustard and pearl grey. The focus of the collection was on cropped pants that were teamed with kurtas, kurtis, blouses and tunics, while an occasional flared palazzo appeared with a summery blouse. Keeping the silhouettes very basic and simple with the slim, lean look, Varun allowed the prints and 3D embellishments to speak a language of style. On the western wear front, it was the drop-waist feminine maxis, some with sheer churidars that were eye-catching, while for the ethnic dresser, Varun brought blouson-cholis with saris. To match the beauty of the collection, the fabrics that were ideal for summer/resort events, moved seamlessly from double georgette, moss crêpe, silk and cotton satin, hand woven Chanderi and then finally to tussar and organza. The final line of white creations moved from sequined maxis to a 3D encrusted blouse and jacket, as well as a great looking tiered maxi that was created in a feminine, flouncy silhouette. The very wearable kurtas, lehengas, saris, dresses, culottes, trousers and cardigans were aimed at the modern Indian woman who is a frequent globetrotter and loves to experiment with her wardrobe. “The Five Petal Story” from the Varun Bahl Prét brand had all the excitement and fashion forward trends offered for the coming season.